Just arrived: TOO MANY COMICS! I’ve acquired literally thousands of comics from multiple collections over the last couple of weeks, and we here at Sterling Silver Comics are hard at work getting them ready for you to buy! 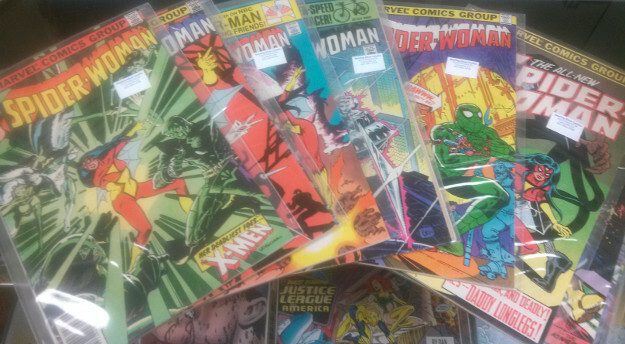 …plus literally thousands more comics! Daredevil! Wolverine! Green Lantern! Hellboy! Simpsons! X-Men! And far more than I can list here…well, I could list them, but that’ll take a lot of time, and I need to start getting them priced! Come by the shop and I’ll let you poke through the boxes…if you find anything you need, I’ll process those books for you on the spot! This entry was posted in Comics on February 9, 2015 by Mike.